4Videsoft AVI to DVD Converter is the professional AVI to DVD Converter, which can help you convert/burn AVI to DVD. Also, it can support AVI, 3GP, 3G2, DV, DIF, MJPG and MJPEG as the input video formats. audio track and subtitle are all can be defined for your preference. 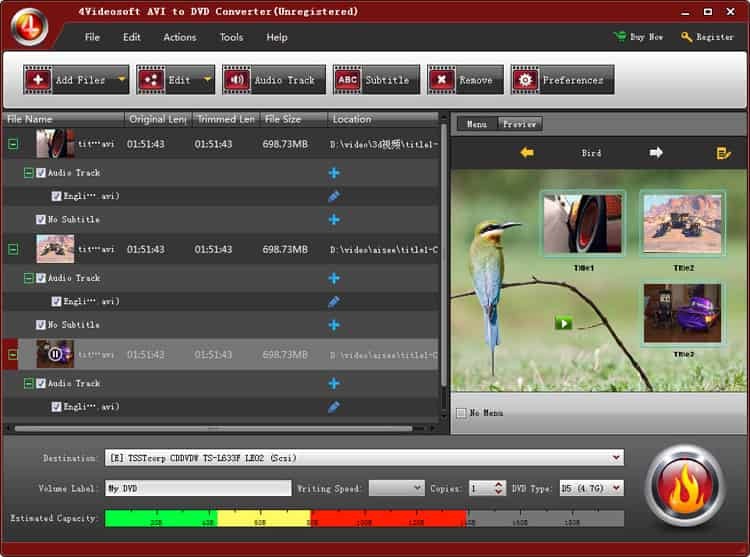 Aneesoft Free BlackBerry Video Converter for Windows is an easy-to-use and totally free software that can convert all popular video formats to BlackBerry video formats. This Free BlackBerry Video Converter can be used for all BlackBerry. 4Easysoft DVD to Archos Suite is a powerful and discounted bundle of DVD to Archos Ripper and Archos Video Converter. It can rip DVD and convert video to Archos simutaneously. 4Easysoft Mac DVD to Apple TV Converter is the best yet easiest to use DVD to Apple TV Converter for Mac conversion tool which has the capacity to convert DVD to Apple TV Mac video MPEG-4, H.264/MPEG-4 AVC, MOV, M4V, FLV, HD H.264/MPEG 4 AVC. 4Easysoft Blu-ray to AVI Ripper is a best and wonderful Blu-ray to AVI converter, which can rip Blu-ray Disc to AVI and other video format, even HD video.